Never before has there been so much media interest focussed on a climb. Well, that’s not true of course. British media interest in climbing has ebbed and flowed over the decades. Huge interest greeted the bemused 'conquerors' of Everest. They were even decorated by the Queen. Two decades later Himalayan expeditions received a large amount of publicity. Characters like Dougal Haston became ‘Stars’ in the perception of the wider public. Sir Chris Bonnington even became a household name and remains so to this day. 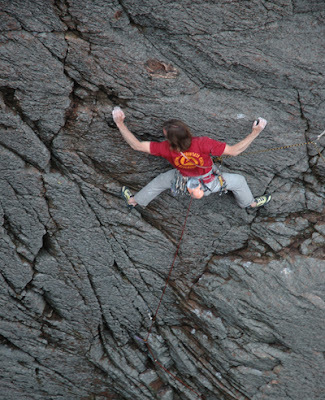 Even the less 'accessible' discipline of Rock Climbing has received plenty of media attention over the years. 40 years ago the BBC pioneered a live broadcast on the Old Man of Hoy, Orkney, a quite remarkable broadcasting achievement for the time, and an event that received huge audiences back in those days of few TV channels. 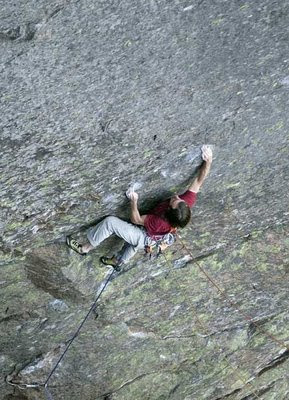 During the last decade and a half there has been a number of very high quality climbing programs on BBC TV. Series such as The Edge, The Climbers and The Face, programs that got right in there at showing what climbing was really like; not glamorising it, but making it understandable to both climbers and non-climbers alike. Just now there seems suddenly to be a huge media interest once again. This month you can hardly fail to turn on your TV without seeing Tim Emmett taking some glamorous lady up a route (no innuendo intended), or Dave MacLeod’s clip from E11; taking a massive fall from Rhapsody, showing on the BBC ‘Summer of Sport’ Trailer. And so, by way of a long lead in, the public were about to see a truly pioneering Live Broadcast of The Great Climb; four pairs of climbers on routes in the Cairngorms, major 9 pitch routes on The Shelter Stone, and then the ‘Finale’, Dave MacLeod leading a new E10 on Hell’s Lum; topping out at 5.59pm, just as the credits rolled. As most of you will be aware, the dreadful weather this summer eventually scuppered those plans. For the 60+ TV crew (which included the Hot Aches cameramen) this was immensely disappointing. An unparalleled logistical exercise had been carried out. 2.5km of ropes had been rigged on the routes. 2km of delicate fibre optical cable had also been rigged from the Base Station to the top of the routes. State of the art High Def cameras had been sourced, the only 8 cameras in the whole of Europe, huge 10kg machines that were sliced in half, joined together by umbilical cords to make more manageable. Surround sound audio was let up. And then, the weather intervened. People might wonder, there must have been a contingency? And the answer is ‘yes’. 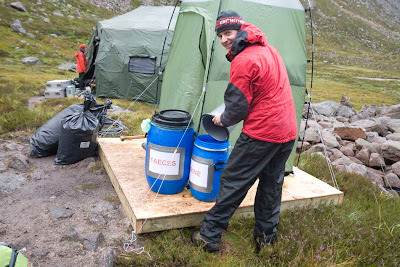 Even if it was raining, Dave MacLeod had an E4 line that he would have climbed in a monsoon. However there was no contingency for ‘Low Cloud’. We needed to get crew in to the base station and on Sunday we all woke at 5.30 am to a cloud level barely above the rooftops. By mid morning the helicopter tried to take the first team in. Flying slowly just a few meters above the ground it suddenly hit a bank of zero visibility; cue rapid 180 degree turn. Later that morning it got the first team in, only for the cloud to descent again, and now it was grounded at base camp. So the upshot was that the program had to be pulled, and the eager public got to see a re-run of Ghandi. But that is not quite the end of the story. You see. Those of you that know a little bit about Dave MacLeod will be aware that his motivation for climbing hard routes is not of course for TV coverage. So when the ‘circus’ departed, the route was still waiting for him. A skeletal team stayed on; the Hot Aches film crew and a few others. 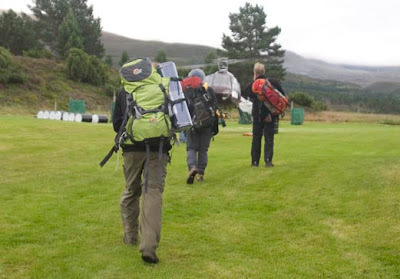 This time we were without the luxury of helicopters; back to our more usual practice of walking miles and carrying huge loads. We waited out the weather, to return to Hells Lum and record the end game. I have now had 24 hours to reflect, and I still think the last 2 days have been quite harrowing. Last Friday, the day before The Great Climb was due to be broadcast, I walked in with Dave to film him make his final preparations. On that day everything was perfect. Conditions were great. The route was dry. It was nice and cool and climbing conditions were perfect. Cubby was belaying. 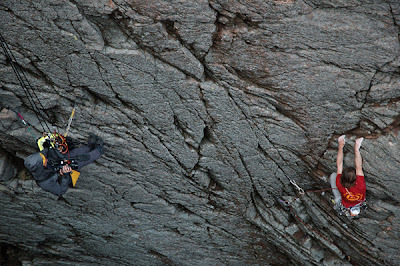 Dave top-roped the route twice and cruised it; a massive margin of ‘surplus’ to spare. That day he was ready, and without a TV audience beckoning, that day he would have despatched it quite comfortably. After the weekend washout we returned on Tuesday and despite great weather, 2 things were different. Firstly Dave was beginning to loose his edge. A full week of rest had taken him past his peak, stamina was rapidly reducing. That might sound odd, but for most top athletes, peak performance has a short duration, and waiting around doing nothing for several days is the wrong preparation. 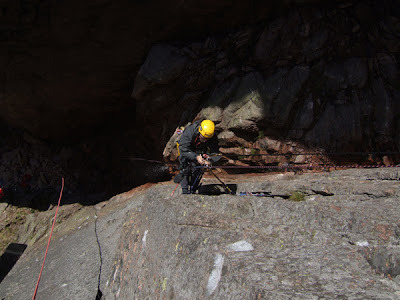 Secondly, some of the holds were now wet from seepage caused by the heavy rain on previous days. So on Wednesday Dave reluctantly took the decision that he could not justify climbing it. He could do the moves with the key holds being wet, but if he slipped off from that point he would hit the ground from a huge height; such a height that death would be quite certain. The decision making process was quite harrowing to watch (and film). 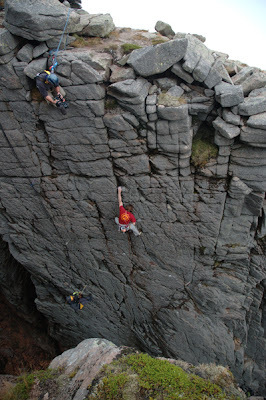 A scenario that we discussed was for me (at my camera position) to dry the holds just before he set off for the lead. I was very relieved that he chose to walk away. Back the next day and conditions were still not ideal. This time it was warmer and there was no breeze. Dave’s hands were greasing up on the holds. The wet holds higher up were now less wet; the key hold was staying dry for one or two fingers, but the rest of the surface was gradually getting wet again after being dried off. The tension at the crag was horrendous. Dave tied on ready to lead and called up to me for an evaluation of how wet the hold was? What a damn question to ask. Of course I want the film ‘in the can’, but MacLeod is a friend, and I don’t want him dead. So I looked at the hold. Probably only the bit for his pinky was wet by now, maybe in the time it takes for him to reach the hold it would be wet only for the second finger? What do I know? I couldn’t do that move even if it was bone dry. I gave him the thumbs up, and he set off. As Dave left past the last point of possible retreat he let out a huge scream, a ‘power scream’ is the term. But Dave never does that. It was ominous. On through the technical crux section and he reached a hold where he could chill for a second. No option of retreat here, but a pause for thought. Then came a second scream. This is not Dave MacLeod. What’s going on? He made it too the next hold, of course, else you wouldn’t be reading this. Then onto easier ground where he paused as I jugged up to the belay in order to film him arriving at the end of the pitch. There was no elation from Dave, just a white face and a shaking head. The rest of the route was filmed. It will broadcast on BBC sometime before Christmas. I will be fascinating, but don’t expect to ‘enjoy’ it. Filming this route confirmed that all the logistical plans for a live broadcast would have indeed created a remarkable and ground breaking TV program. The timings, changes in camera position, climbing time, all the plans that had been carefully worked out would have given a remarkable finale to the program. On Radio Scotland today, the Producer, Richard Else indicated that this footage will indeed go out as a special program on BBC some time in the next 4 to 5 weeks. You can of course read Dave MacLeods own harrowing account of the route on his blog. 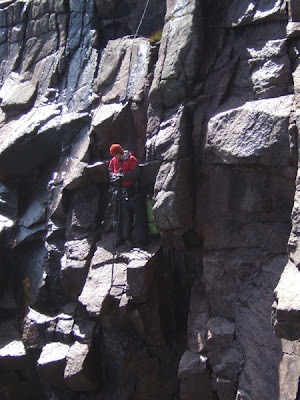 Our thanks go particularly to Claire MacLeod who puts up with a lot; climbers, TV crew and hanging out for many hours in a damp gully high in the Cairngorms - on her birthday, no less. Thanks Claire. The cancellation of this weekend's broadcast was a great dissapointment for all 60 plus people involved in what would have been a truly groundbreaking live TV outside broadcast. 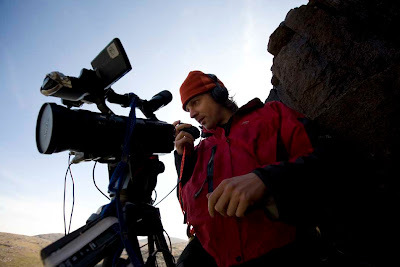 The Hot Aches crew were part of a team of 12 camara crew working on the show. You will probably not be surpised to learn that Paul and I were to be filming the 'finale'; Dave MacLeod attempting to climb his new route on Hell's Lum. 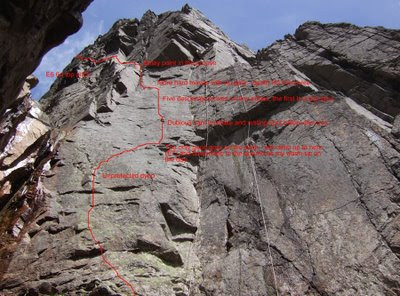 So having become well aquainted with that route I can confim that 1) it looks to be a truly superb line 2) it looks to be both very hard and extremely poory protected. 3) It would have been a very tense and dramatic shoot. The dissapointment is obvious, however it was tremendous to be involved in such a major broadcast project. Although the broadcast didn't go ahead, it did prove that the logistical challenge of broadcasting live, in high definition and surround sound, from a remote and dangerous envirnment could be achieved, and this bodes well for future broadcast projects. It was great to work with a team of such motivated and hard working experts. The task of rigging 3 major routes involved many kilometres of fibre optical cabling and many more kilometers ropes. New cutting edge cameras from Sony were quite literally chopped in half - joined by an umbilical cord, so that the camera person would operate the front half whilst a safetly officer would carry the bulk of the weight and tranmistion unit in a hefty backpack. The pictures we were getting were quite astounding. 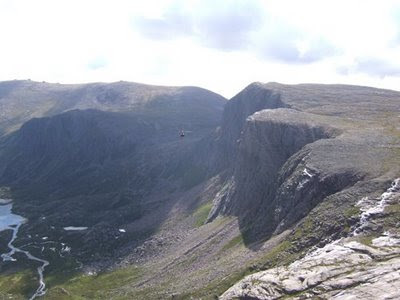 Equally impressive was the commitment to not damage the wonderful envirnment that exists in the Loch Avon basin and surrounding corries. The 'leave no trace' strategy was very well thought through, monitored and adhered to. E11 continues to pick up awards around the globe. Most recently Best Climbing Film at Squamish, Canada, and then last week The Grand Prize "Grand Prix du Festival" at Festival International du Film des Diablerets, Switzerland. E11 will continue to tour the world for the next 6 months. About 25 more festival screenings are programed at this stage in locations as far flung as Nepal, Bulgaria, China, USA, South America and also many in Western Europe.